The embryonic gut plays an important role in the development of both the cellular and the humoral immune systems. The thymus and the avian bursa of Fabricius, both central lymphoid structures responsible for the development of normal immunity, are derivatives of the primitive gut. Experimental evidence suggests that multipotential stem cells, originating in the bone marrow, are induced by the thymus to differentiate into T-lymphocytes and, in the avian example by the bursa of Fabricius into B-lymphocytes and antibody secreting plasma cells1, 2. Removal of the appendix, sacculus rotundus and Peyer’s patches in young rabbits results in an antibody deficiency syndrome similar to that observed in the bursectomized chicken3. A human analogue to the avian bursa has not been defined unequivocally but it has been postulated that gut associated lymphoid tissues may represent a bursa equivalent4, Owen, Cooper and Raff5 have recently shown that immunoglobulin bearing lymphocytes can develop from stem cells which migrated from the yolk sac to the liver. Liver fragments obtained from 12-15-day-old mice were grown in culture. B-cells, initially absent, could be detected immunohistochemically after 1 week of culture, suggesting that the liver may be the B-cell induction site in mammals. During postnatal life, the human gut develops the histological characteristics of a secondary lymphoid organ6. 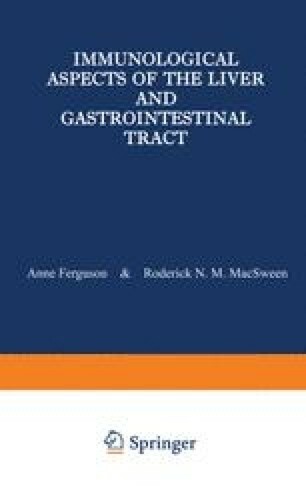 Lymphoid follicles, germinal centres, small lymphocytes and plasma cells are abundant, and the intimate proximity of lymphoid tissue with the surface of the gastrointestinal tract assures a close contact with a multitude of microbial and alimentary antigens. Coproantibodies can readily be detected in stool eluates. It has been shown that secretory IgA is quantitatively the most important gamma globulin in the intestinal secretions7, 8. This 11-S gamma globulin has unique physical and biological properties which are discussed in a separate chapter. It is not surprising that IgA producing plasma cells are numerous in the lamina propria of the entire gut including the rectal mucosa7 and outnumber IgM and IgG secreting plasma cells by ratios of 20:3 :1. In addition, IgE containing plasma cells are regularly found in the mucosa of the normal gastrointestinal tract9. Large numbers of small lymphocytes, probably T-lymphocytes, are distributed diffusely or in aggregates throughout the intestinal tract.